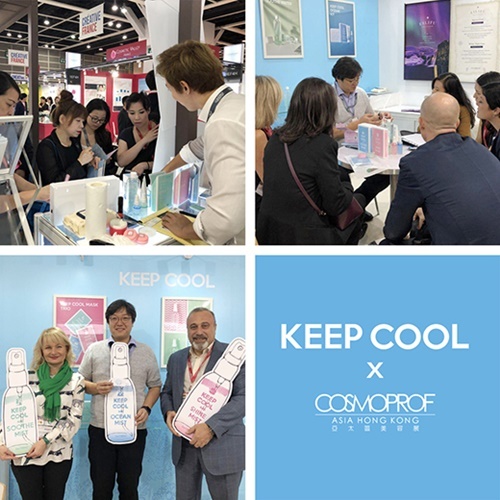 Keep Cool, a global lifestyle skincare brand which plans to launch various new products in coming December said that the brand revealed its new products at ‘2017 Cosmoprof’ which was held from 15th to 17th November in Hong Kong. ‘2017 Hong Kong Cosmoprof’ is well-known as the biggest beauty fair of Asia and this year, more than 2,800 companies from 50 countries including South Korea and over 60,000 audiences took part in the fair. According to one of the participants from Keep Cool, the brand successfully presented the new products at the beauty fair, attracting a lot of buyers from overseas, and the most popular products were ‘Keep Cool Mask Pack’ and ‘Fixence™ Mist which will be renewed and newly launched in coming December. Unlike other makeup fixers of other brands, ‘Fixence™ Mist has three functions: makeup fix, essence and moisturizing. As soon as user sprays the product on face, the skin will be fully moisturized and become silky-smooth at the end. The product is planned to be launched in coming December. The beloved ‘Keep Cool Mask Pack’ which is also known as ‘1 day 1 mask’ moisturizes your skin throughout the day. Three types of mask pack have different functions such as ‘concentrated moisturizing, brightening, soothing’ so that users can choose and care their skin depending on their skin type. The special natural ingredients of Keep Cool add the brand value as users can use the product without any skin trouble.